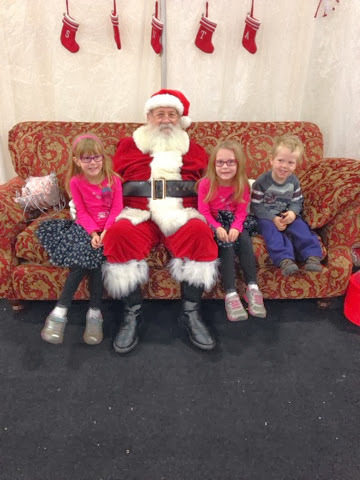 This jolly fellow asked my kids what they would like for Christmas. Little Man is confused by this question, apparently. He wants for nothing, this one. His answer was a shrug followed by "a present." Somebody is doing something right. Kids are so cute! Last year a cashier asked Spencer what he wanted Santa to bring him, and he said "whatever Santa brings me will be great." This year you can't see the paper, his list is so jam packed.